I began this morning by reading an article in the Washington Post about the trouble institutions of higher education are having filling freshman seats, noting that college admissions have dropped two percent over the last year. The reasons are plenty, but the article points to the challenges of college costs on families as the primary reason. I’ve written on the issue many times, but these trends will continue. As we push more students toward college with the promise of great rewards, we do much less, at the state and federal government levels, than ever before, putting our youth in somewhat hopeless desperation about what life has in store for them. My brother, a CEO at a large, tech company, emailed this week about a discussion we were having about another Washington Post article about how the US is losing its competitive edge in science. He said: “I don’t envy our kids as our generation has pillaged the economies long-term outlook.” And he’s right. The Millennials, and now Generation Z, have a much darker outlook than we had. While we rode the wave of economic and technological growth, we left a blemished environment, both economically and naturally. Thus, the new generations are more needy than we were, requiring us to extend the social safety net well into their late 20s and early 30s. Our college graduates move back home, require us to help pay for their student loans (if we haven’t paid already), and provide “subsistence kits” through money, food, health care, and even cell phones. If this doesn’t describe you, it describes someone like you or someone you know. And remember this: we created this reality: they didn’t. Take this all in consideration of what we experienced this week as we revisited the Kennedy years. Yesterday’s 50th anniversary of the JFK assassination has rekindled melancholy, perhaps even hurtful, memories for many of us. I was born in 1962, so my cognition was not first generation. To understand how big an event the assassination was, I just had to open my bedroom closet and look inside. Growing up in Winnipeg, Canada, my parents kept the November 22nd and 23rd newspapers and still have them. They never kept any other newspaper, but they kept those newspapers about a leader from another country. I’m not here today to debate the legacy of JFK, although I am sure that if he had lived, we wouldn’t regard his presidency with quite the same reverence. Over time, who knows what would have been made of the Bay of Pigs and the Cuban Missile Crisis as Kennedy edged further into Vietnam. Two presidents would have to live through his legacy. And as media began to evolve toward a 24/7 system, his private life would not have been so private. Camelot would surely pale. Since its creation, over 210,000 Americans have served in the Peace Corp in 139 countries around the world. The Peace Corp allows BA graduates to serve in humanitarian roles for a period of two years in areas of need, providing much-needed services and promoting the decency of America. Building upon the legacy of the Peace Corp, President Bill Clinton created AmeriCorp in 1993, which arguably is a domestic version of the Peace Corp. To date, AmeriCorp has enlisted over 800,000 members. Both programs allow youth of 18-years or older to participate, although almost all participants have an earned bachelors degree. Many countries have mandatory military service requirements. The United States has never had that type of program, although we have used a draft in times of need, the last being with the Vietnam War, although reservists have been re-drafted in both Iraq and Afghani wars. But perhaps it is time to reconsider public service, rather than strictly military service, opportunities for our high school and college graduates? The challenge with high school graduates is that they are not necessarily mature enough to tackle sophisticated careers or even college. There is often talk of “gap year” or study abroad to expand the capacity and peripheral knowledge and experience of youth. But what if we could expand either the Peace Corp and/or AmeriCorp to allow for an experiential period where they could help, learn, and mature, coming out of the experience with a better understanding of their world and how they fit in it. The challenge we will have in the next several decades is what to do with the 18-somethings in the job market. While more students will enter higher education, even more will not. Those that do will start trending toward shorter degree programs, perhaps even badges or short-term certificates. There will exist an ever-expanding swath of our 18-24-year olds who are lost without much vision and even lesser experience. In combination with 3.5 million unemployed 18-24-year olds (see below), perhaps it is time to revisit our current public service programs to aid today and tomorrow’s youth. Put together, the Peace Corp and AmeriCorp account for approximately $1.4 billion annually ($378 and $1 billion respectively). This is in comparison to $685 billion for the Department of Defense and $42 billion for foreign aid (including State Department budget). What if we moved some of these funds around and expanded the current Peace Corp and AmeriCorp to approximately $10 billion annually, with great expansion for high school graduate experiences, complete with college aid from their public or military service? 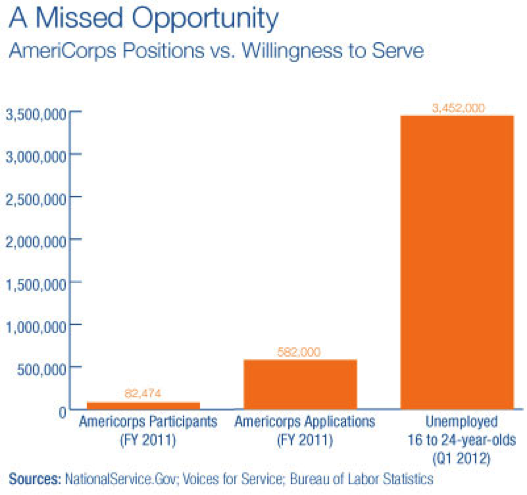 Both Peace Corp and AmeriCorp have education debt reduction incentives, and these could be expanded. But instead of 90,000 people in the field each year, why don’t we put one million or more people in service. And perhaps it could be variable, from six-month deployments up to the two-year stints that are required in the Peace Corp. We don’t need one size fits all, but we need something to allow for our youth to find their place in this world and build that capacity for volunteerism while also a better understanding of the world around us. Fifty years after JFK’s short, 32-month term, we can celebrate his legacy by revisiting his vision for a better America. Thanks for the great review of the impact that the Peace Corps and AmeriCorps have had how that success can be used as a model for increasing public service and opportunity for today’s younger generation. One side note about the history of AmeriCorps: Prior to AmeriCorps, there was VISTA (Volunteers in Service to America) which was created in 1965 an “American” version of the Peace Corps. Like the Peace Corp, VISTA was designed to provide young people (college graduates primarily) with training to help low-income folks in U.S. cities with various services and anti-poverty programs. VISTA was expanded and re-adapted by the Clinton Administration to form today’s AmeriCorps. I agree with you that we are missing a great opportunity to further expand the ideals behind these programs to better serve young people and society, specially given that so many more are questioning the need for a traditional college degree.